Are you planning to convert your water heating and cooking system to a gas system? We’re the leading plumbers and gas fitters in Australia. You can contact us to book for an appointment and discuss a wide range of issues, including connection options available to the main gas line, environmental factors, and the costs involved. Fast Plumbers is a fully licensed, experienced, and professional gas fitting and plumbing company. We come with most plumbing components and equipment in our service vans. We equip them fully to ensure most repairs or replacements are done during the first visit without keeping you waiting. Are you in need of a reliable water heating system? Whether you’re planning to shift from an electric to a gas water heating system, or you want to repair or replace your existing system, contact Fast Plumbers through 1300 481 182 and we will discuss more about your hot water needs. Hot water gas heating systems are more efficient than electric systems in terms of cost. Moreover, you’ll never have any worries about peak and off-peak issues. Thus, you will have a continuous flow of hot water. 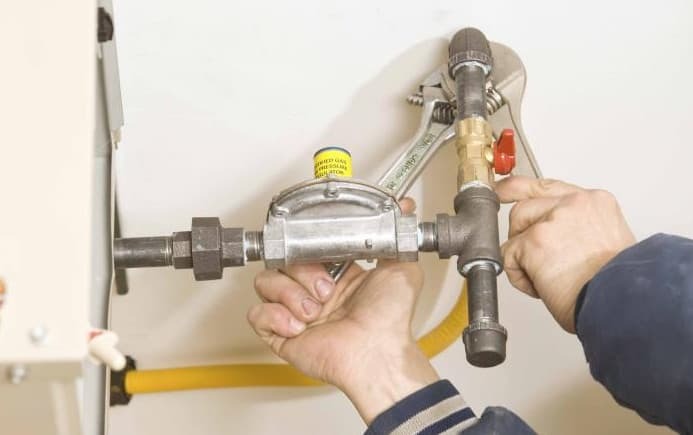 You’ll use the gas system whenever you need it without running out of hot water. In case your home has many people, especially teens who hardly stick to time limits, or you only need a minimal amount of hot water, then your best option would be a water heating system powered by gas. We have reliable hot water solutions for all types commercial and residential properties, and our prices are highly competitive. Having a functional and effective water heating system is important, especially during the cold winter season. During this period, you’ll need a reliable and cost-efficient hot water system. We have what it takes to install a water heating system in your home that uses gas and with fast start up. After all, no one would want to freeze while waiting for an unresponsive heating system. It goes without saying that most chefs rely on gas-powered ovens for cooking. They are economical, cook faster, and are more environment-friendly than electric ovens. Moreover, food prepared by gas ovens doesn’t dry out excessively, so gas ovens are ideal for slow-cooked food and roasts. If you’re planning to upgrade or replace your current oven, then consider going for a gas-powered one. It will improve the kind of meals you prepare while still minimizing the costs of operation. We install all types of gas ovens throughout all the major cities and its suburbs. We also offer repair and maintenance services to your existing gas oven. Our team of gas experts will assist you in whichever gas needs you’re having at any time of the day or night. Leaks involving gas are extremely dangerous. They should always be treated as emergencies that have to be attended to immediately. Whenever you have gas emergencies, and you require fast response without any delays, contact Fast Plumbers through 1300 481 182. We will send a plumber immediately to fix the problem before it causes any damage. We have highly qualified gas experts and they’ll keep talking to you in a friendly manner to assist you on how to remain safe and calm as they come over in no time. We have dealt with gas problems for a very long time, thus you’ll be in good hands when hiring our service. Call us right away in case you notice the smell of gas anywhere within your home or around your gas-powered water heating system. We use advanced technology and special equipment for tracking and locating gas leaks. We repair the leak upon locating it. Fast Plumbers won’t leave your property before everything is rectified and double checked to guarantee your safety. Also, feel free to contact us for all gas conversions, repairs, maintenance, and installations.